Nokia's rolling out the punches for their delayed N8 phone. After filming the world's smallest stop-motion video with it, they played a movie to 1,500 Swedes on the world's largest cinema screen—through its miniHDMI port. 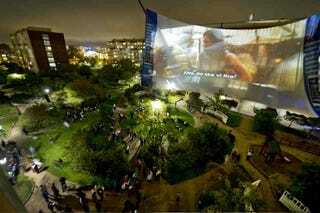 In Rosengård, Sweden, a screen measuring 51m x 28m in size was hitched up against a tower block so the film Prince of Persia could be projected onto it by four XLM HD30 projectors. Outputting the movie via the miniHDMI port to those projectors was the humble N8.